At some point in your life, you will meet a woman who snaps irrationally, craves uncontrollably and shops like mad, once in every month. This usually happens a week or two before their period and the science behind it – premenstrual syndrome or PMS. Study suggests that for 1 in 20 women, PMS is intense enough to cause disruption to the quality of their life, resulting to misunderstanding with their loved ones. Though PMS can sometimes be mistaken with anxiety or depression, it can be identified by its symptoms such as mood swings, loss of confidence, being emotional and irritable. What makes this worse is that women also undergo physical struggles such as headaches, migraines, abdominal bloating, breast tenderness and even asthma. PMS may be a monthly battle women learned to live with but you can always look for back up – ATC Evening Primrose. Let go of your PMS worries with ATC Evening Primrose. ATC Evening Primrose is recommended to be taken one capsule a day, preferably with warm water. 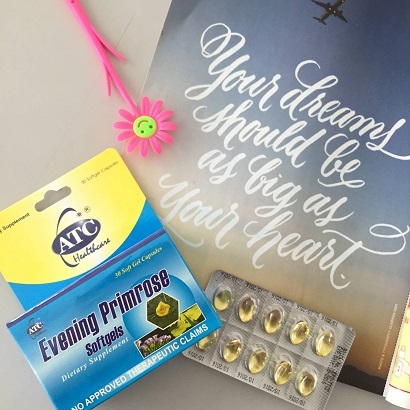 ATC Evening Primrose is available at Mercury Drug and all leading drugstores nationwide for SRP P6.00 per soft gel capsule. ATC Evening Primrose, the supplement for women.